Akaka Falls is located on the lush green side of the Big Island of Hawaii not far from Hilo. While viewing some waterfalls on the Big Island requires hiking to valley floors well off the beaten path, not so here. Of course, this makes the falls a popular stop for tour buses and large crowds. But many groups just stop by for a quick peek from the closest lookout to the parking lot, so taking the time to walk more of the trail and take in other views of the falls is a nice option if you're looking for more than a quick glimpse. Akaka Falls State Park is less than half an hour from downtown Hilo and about two hours from Kona. 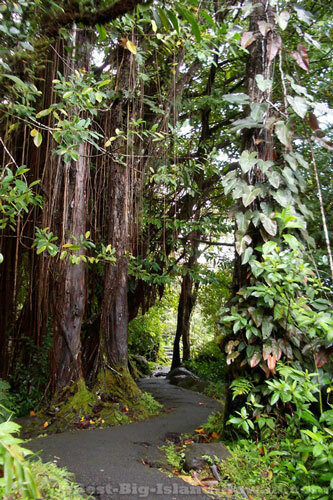 To get there, turn off of Highway 19 onto Highway 220 between mile markers 13 and 14 near the town of Honomu. This three and a half mile road passes through old sugar plantations and eventually dead ends at the park, which is open daily with and entrance fee of $5 per car. With a drop of 442 feet, the falls is more than two and a half times higher than Niagara Falls. Views of the falls are from a couple of different locations, both accessible via paved footpaths through lush green forests filled with bamboo trees. A quick view of the falls only takes a couple of minutes. 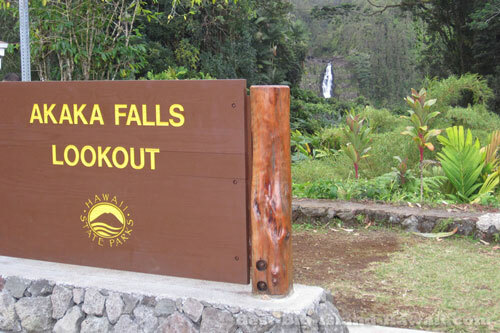 Walking the whole trail takes about a half an hour and includes a view of Akaka's little 100 foot brother, Kahuna Falls. The forrest area that the trail covers around the falls is really beautiful and worth taking in for its own sake, not just as a path to the falls. 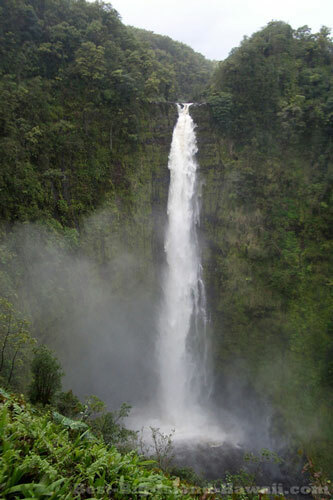 Akaka Falls is typically listed as a "not to be missed" stop by all the guidebooks. The Lonely Planet guide calls it "the Big Island's most impressive drive-up waterfall". And for good reason—with such easy access and impressive views, checking out these falls is a no-brainer. In addition to the obvious appeal of the falls itself, it's also a nice place to get a taste of what the Big Island of Hawaii's rainforests are like without a bushwhacking trek that requires a machete. And, if you're spending most of your time on the drier Kona side, it is certainly a nice change of scenery. For another accessible waterfall nearby with its own charms, also check out Rainbow Falls.